Momma swan is a very friendly black swan. She disappeared between midnight and 4am. There was no noise made, no feathers left anywhere or signs of a struggle. 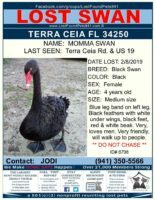 Her mate is very confused and depressed, her human family is a mess.Please help us bring Momma Swan home. She never would have just walked away from her mate and pond.